First, thank you, everyone, for the delightful stories of your kids and their lovies! Someday, we need to organize a get-together for all these special softies, complete with paper champagne glasses, so they can swap stories about their human friends. Oh, the tales they would tell! Then I'd pitch it to Disney for the screenplay of Toy Story 4, and encourage them to get Kleenex on board to sponsor the door gifts. Second, let me share that it's hard getting back to sewing after a long break. 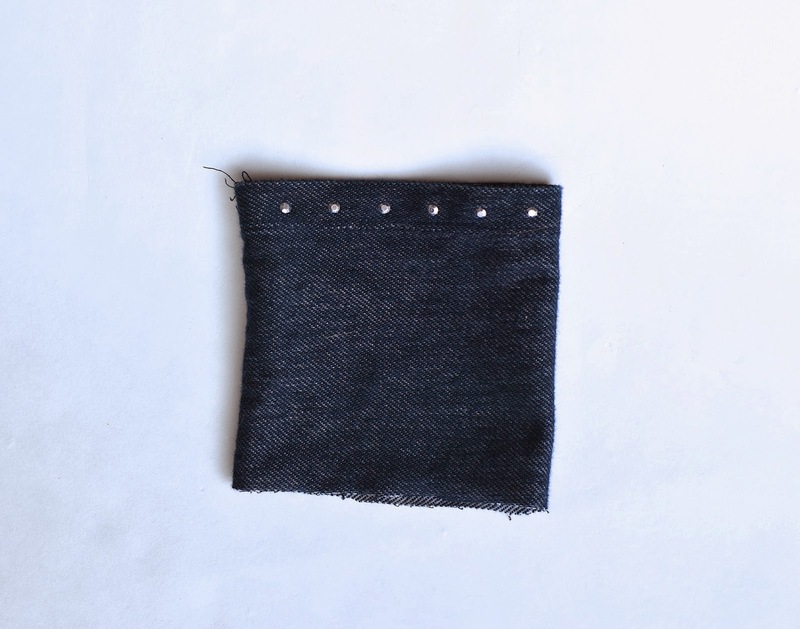 Sometimes, my attitude towards sewing (specifically: procrastinating, avoiding it, complaining on the blog about it, always preferring to buy than make clothes, etc.) makes me wonder how much I really like it at all. I mean, I've always thought that sewing is very much like exercise. It's stinks when one just starts to do it or resumes it after a long hiatus, and the results are usually dismal. But if one perseveres, one gets better and more efficient at it. And, inexplicably, it eventually starts to feel nice and one even gets the sense that one's day (or life) is incomplete without it. Then, with enough time at it, one settles onto a disconcerting plateau and has to increasingly kick up one's challenge level several notches in order to get the satisfaction one craves. By which time it gets to the point where one can almost do it in one's sleep (figuratively), totally divorced from any emotion whatsoever, so that one is finally able to tolerate its more odious manifestations, like alteration and mending and repurposing (only to avoid the alternative of simply discarding, about which one often feels extreme guilt; this is totally different from voluntary, creative upcycling, which isn't odious at all). So. . . maybe I like sewing about as much as I like exercise- love the results, don't love the work. 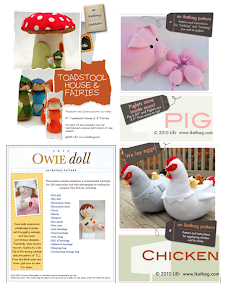 I know of many people in sewing blogland who gush, "I loooooooooove sewing! I can't stop! It's so much fun! I am, like, having an affair with my sewing machine and neglecting my husband! I wish I had more hours in my day to sew everything I want!" I read those posts and think, "We must come from different planets. 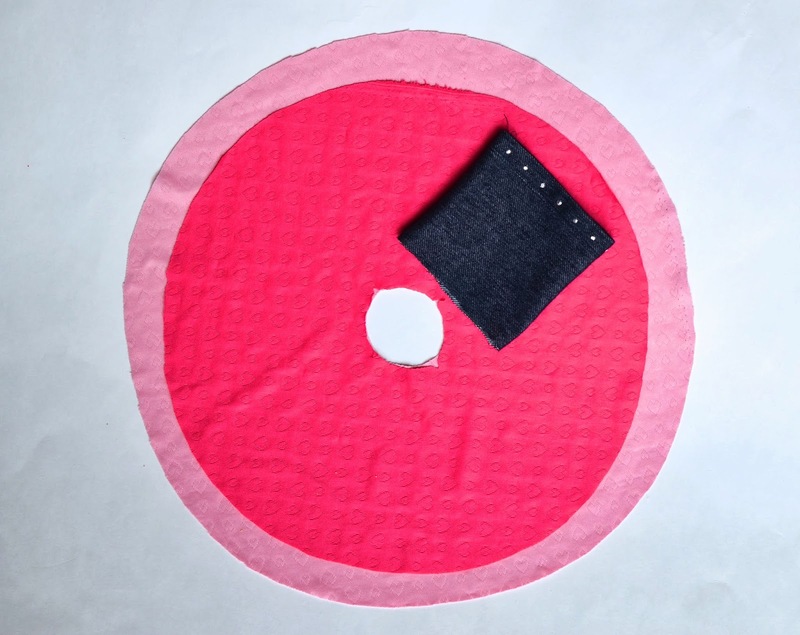 Your planet must be where sewing takes nanoseconds to get done and someone else always does the layout and cutting and seam-ripping for you and everybody's body is a cuboid so no one ever needs darts and all you have to do is choose fun fabric and sew straight seams. On my planet, all we seem to do are adjustments, alteration and mending during the weekdays, and sleevecaps and armscyes on the weekends." 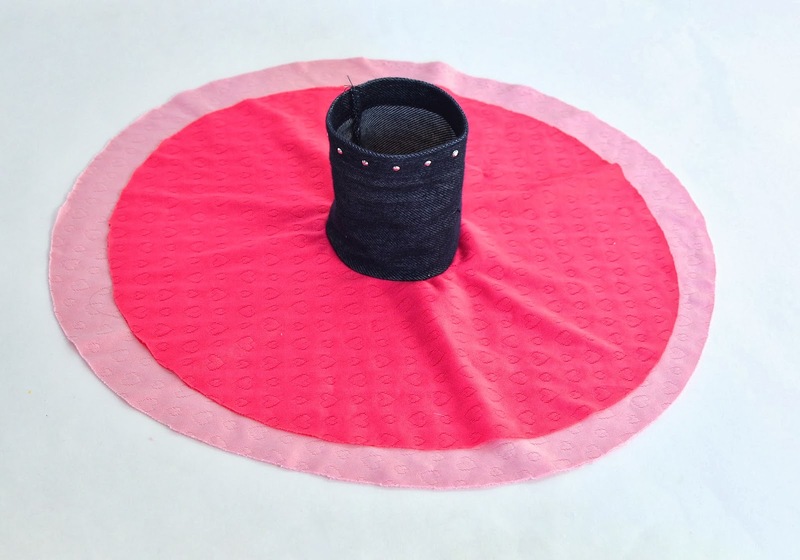 And I feel kinda left out of the whole Universal Blogosphere Happy Sewing Clique because I've fallen woefully short in the Excitement Department. Either that, or, unbeknownst to me, I've turned into a tailor. Like my grandmother. Except without much of her passion (and I bet Grandma wasn't ever conflicted between sewing and cardboarding). 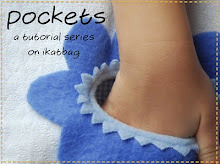 I hope that people reading this don't think that all my sewing adventures on ikatbag are the result of me faking it just to find things to blog about. Heavens, no. I genuinely like making things. I genuinely like designing things. I genuinely like thinking of ways to make things look and work better and more efficiently. And you could probably catch the equivalent of sewing rabies just reading some of my felt food or costume posts. I just don't enjoy the mechanism of transferring those ideas to fabric as much. There are times when I've sat at my sewing machine and said, "Well, it's you and me again, babe. How about you help me exorcise this stuffed toy design from my head so I can breathe again and get on with my life and then we don't have to see each other for a while?" I guess it's for this same reason that I haven't named my sewing machines Gertrude or The Honorable Francesca or whatever, or made quilted covers for them. We aren't BFFs; they are my workhorses, and they happen to be good at what they do. Anyway, I've been mending (ah - light dawns on her sewing ennui). Or, more accurately, amputating unmendable parts of garments, thus buying them a few more seasons of life. and some stretchy tubes for turning into other things. to make a strapless gown for a favorite friend. 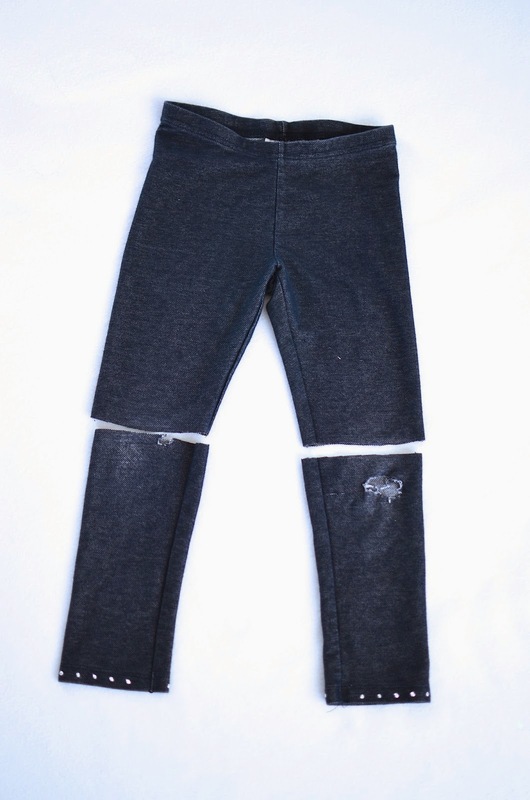 First, cut a legging leg to length (or sew one from knit fabric), so that it ends a little below the waist of the wearer. This will be the bodice. 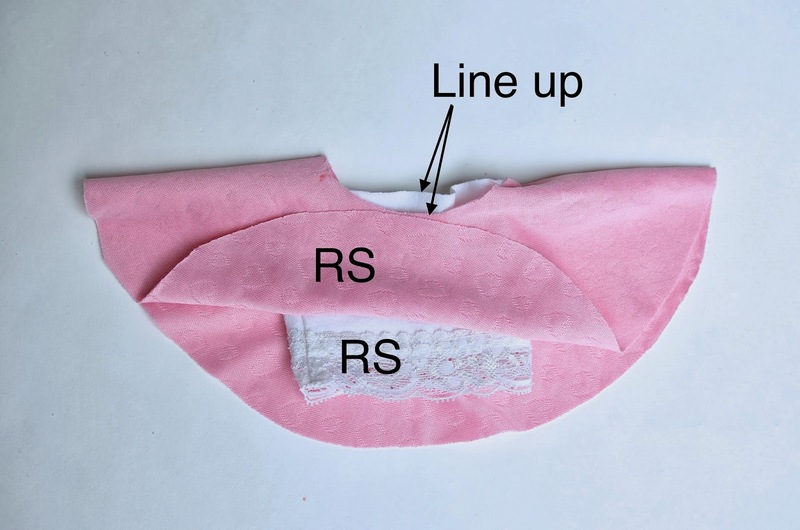 Measure the length of the skirt you plan to sew onto this this bodice. 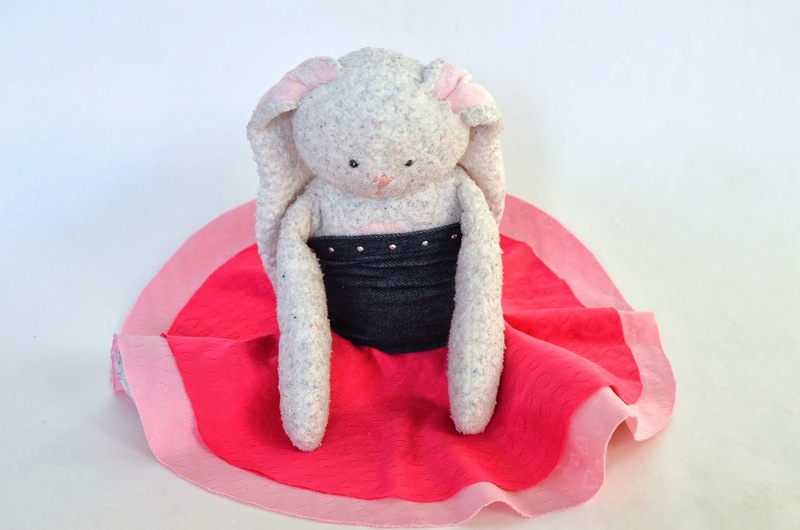 For this doll, the skirt was going to be 2 3/4" long, without SA. 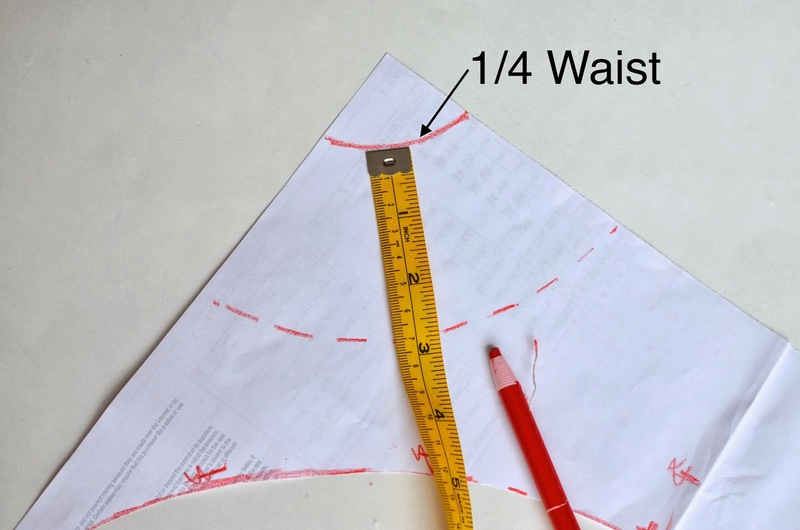 Also measure the waist of the wearer. 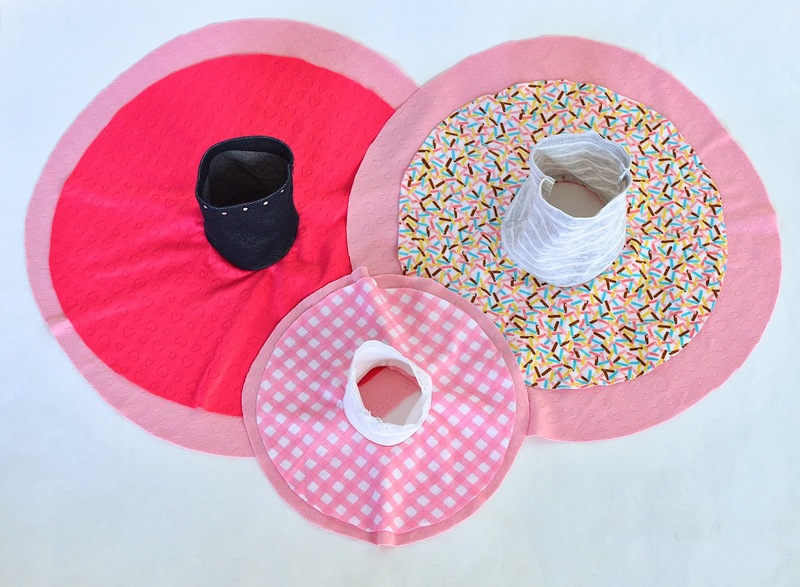 Now make your skirt pattern. 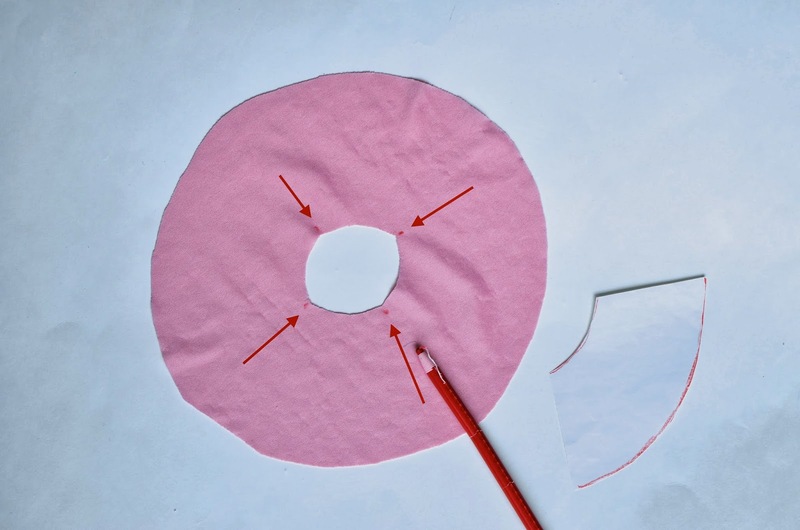 Begin by dividing the waist measurement by four and drawing an quarter-circle arc of that length. There is a simple Math formula relating this quarter-circumference value to the radius of its circle - anyone who's done middle school Math will know this. Or you can eyeball the radius to get the quarter-circumference. From that arc, mark the skirt-length distances to create the hemline. Ours was 2 3/4" from the arc. Cut out the paper pattern. 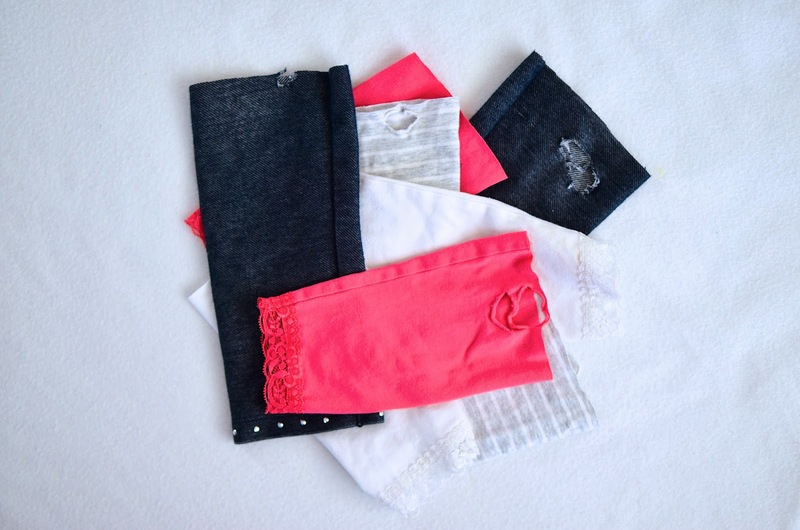 Fold knit fabric twice (with the second fold perpendicular to the first) to create four layers. Lay the pattern with the straight edges along those folds and cut out the skirt with seam allowances at the waist and the hem. 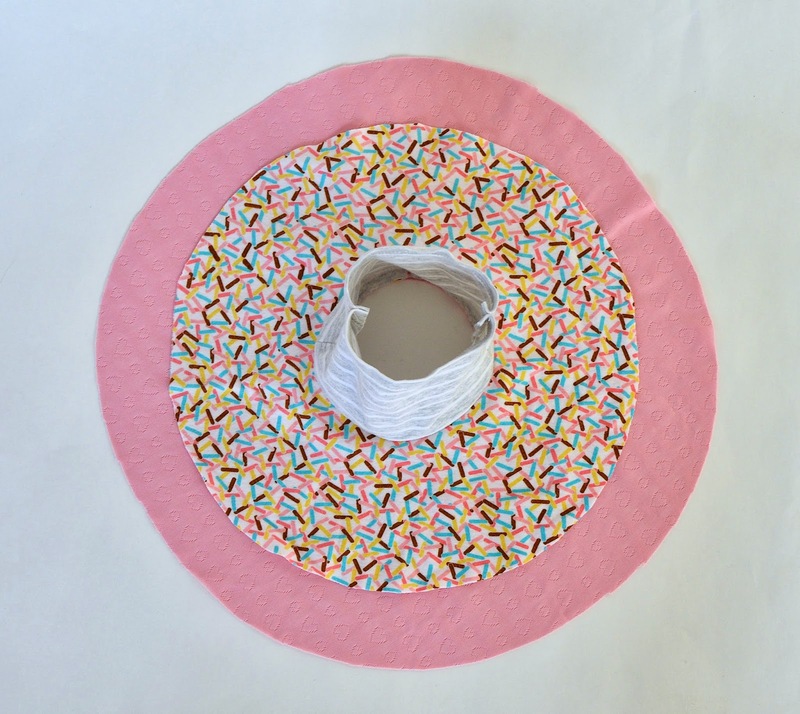 Open up the fabric (it should be a full donut) and mark the quarter points around the center hole. Make the same quarter marks around the bottom edge (i.e. the waist) of the tube bodice. and with their quarter marks matched up. Pin in place if desired. 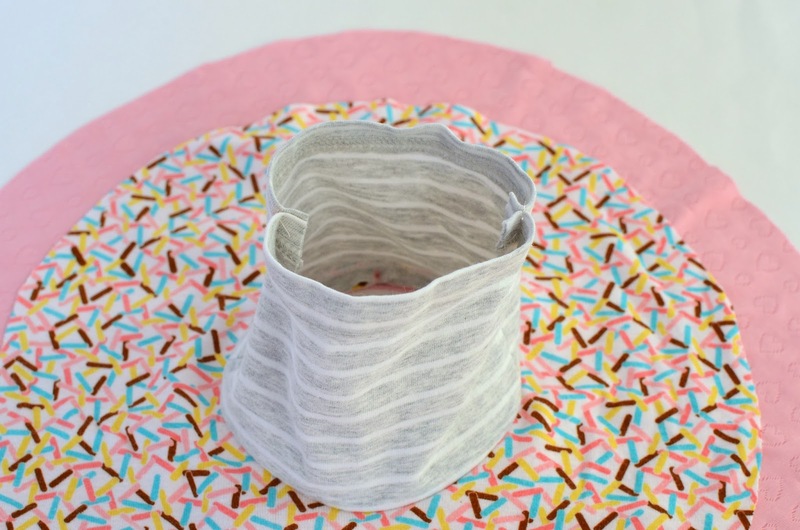 Sew around the waist of the skirt/bodice ensemble to attach the two pieces. Trim the SA at the waist and turn RS out. The dress is finished! Here it is with a double-layered skirt. 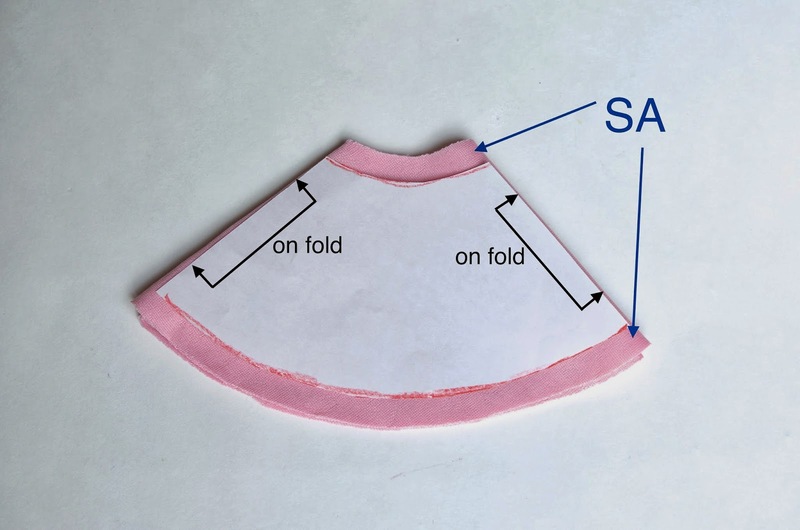 Simply combine both skirt layers as one, and sew them to the bodice. 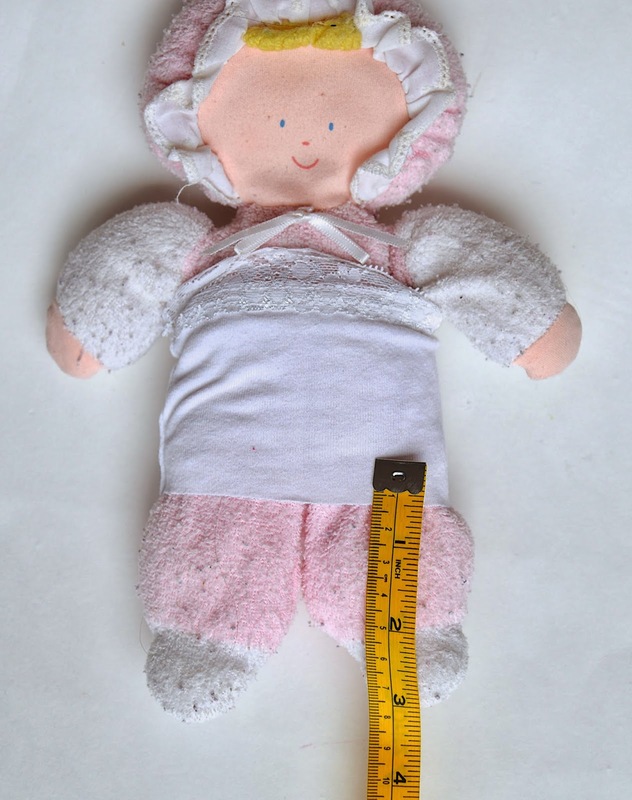 If your doll has a significantly wider chest than can be accommodated by a single legging tube, cut BOTH legs apart along their seams, and join them together with two seams to make a wider tube. one for each of the girls' Favorite Friends. A dress like this works for 18" dolls, too. 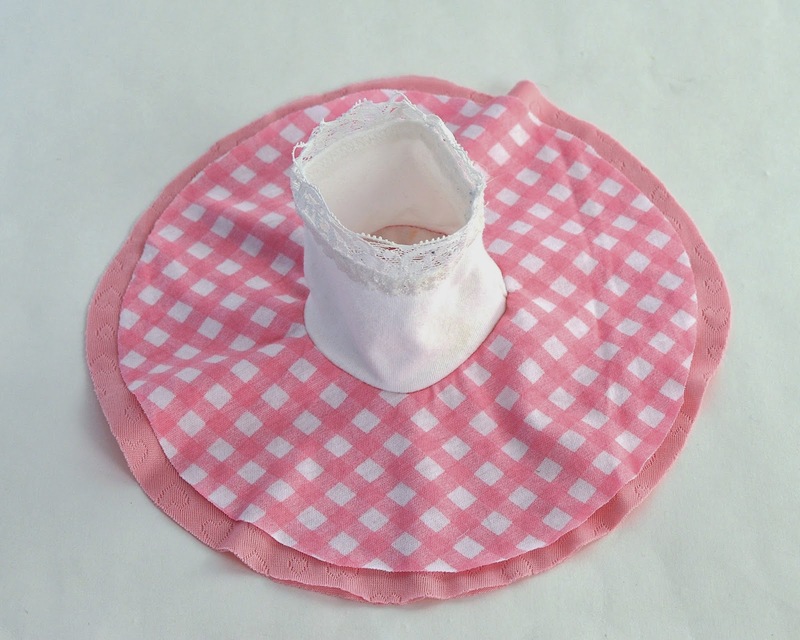 Our leggings were 4/5T size, and a little snug for this particular doll, so if you have leggings in larger sizes, they'd be perfect. Q : Will this work on children and... me? I'd personally include shoulder straps to prevent wardrobe malfunctions. I'd shape the top edge of the bodice and armscye region so the whole tube sits higher on the chest and lower in the back, for more modesty. I'd further shape the side seams to allow more room in the bust region for women. 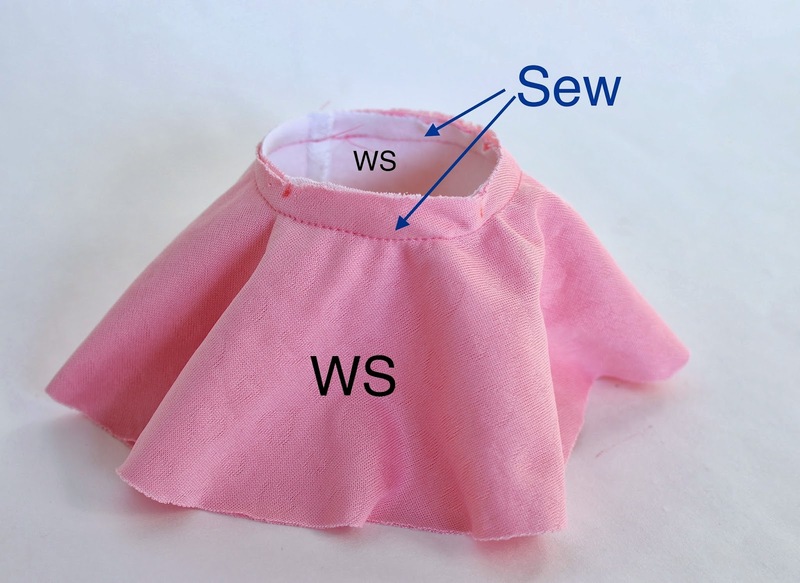 Q: Can children sew this dress for their dolls? After all, it looks like a whip-up project. 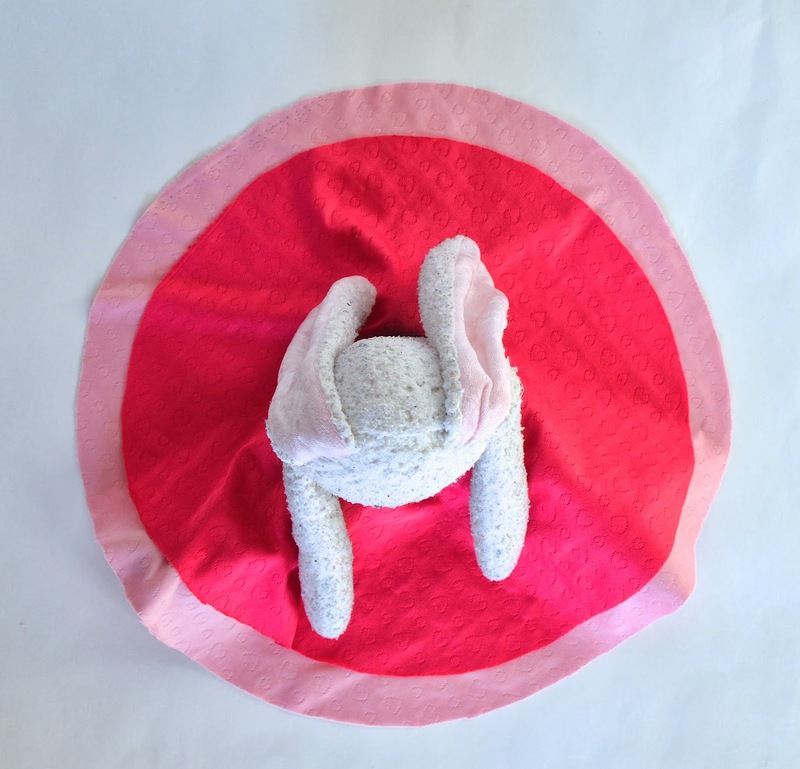 A: It is a whip-up project - and there is only one seam to sew. However, that seam joins a straight edge to a curved edge, and both edges are continuous circles. 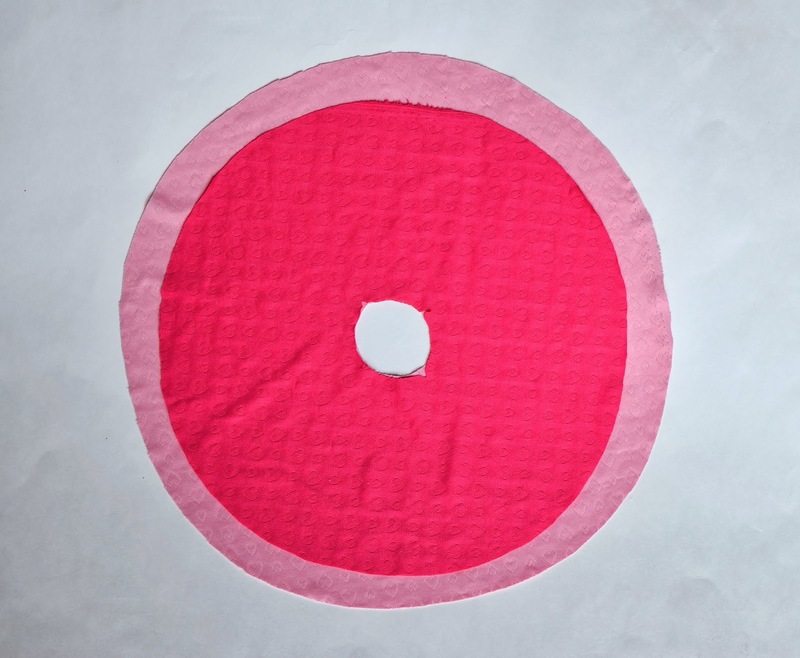 And both circles are small i.e. they have tight curvatures. So if you think your kid can manage that, then yes, children can sew this dress for their dolls. If you help. A lot. 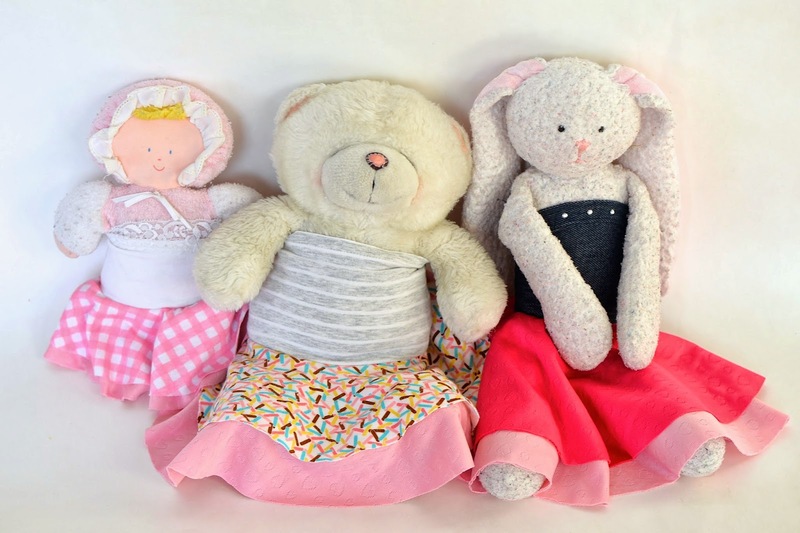 You could add to the pains of exercising/sewing "the time it takes to write a clear, comprehensive blog post + excellent photos"
Those stuffies are sure stylin' :D great use of old leggings scraps. I meant to add that the dresses are really cute. :) Done now. I feel the same way about sewing. It is a means to an end to get the designs out of my head. If I could hire someone to do the actual sewing, well that would be a dream come true. Just conceptualize and let someone else do all the work. But that isn't how it works, so I go through sewing spurts where I will catch up on all my ideas, and then get burnt out and swear it off for a time. Then I'll get another sewing idea itch that I have to scratch, and the cycle begins anew. 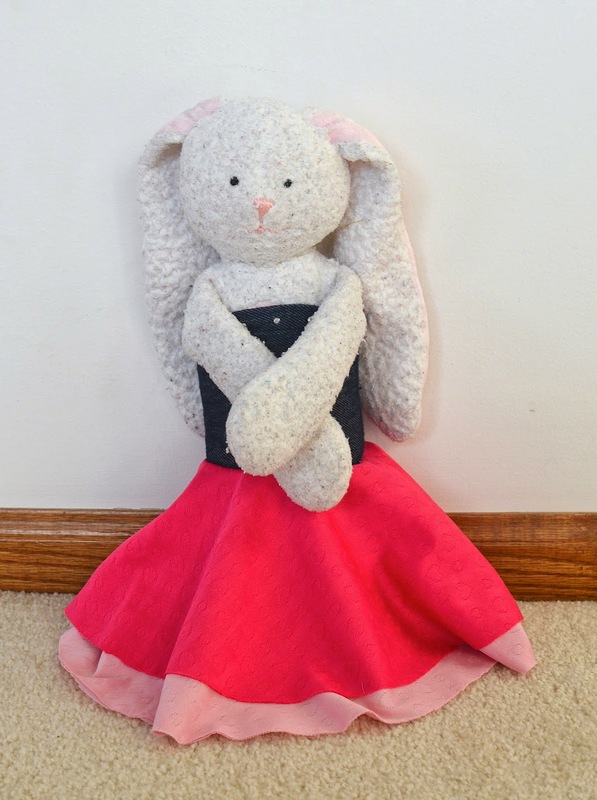 I am going to make one of those circle skirts for myself next Spring, and then I will be the most awesome bunny of all! 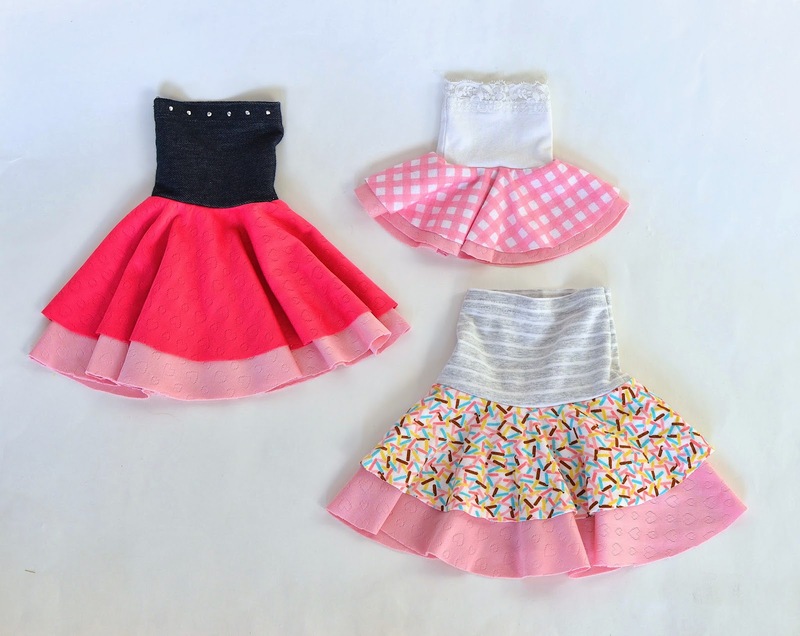 Cute dresses, and fast, too. Great idea ! Thank you. I like your ideas about sewing... I feel this way sometimes. The thought of all that tracing, cutting, trying on seems to stop me from even starting, but then if I start, I love it..
Oh I thought I was the only one that felt this way about sewing. With all the money I have spent on sewing machines, fabric ,notions I should adore it. I love the looking and dreaming about the projects just not the doing of them. excellent both the love/hate sewing honesty and the whip up... sometimes that is exactly what i need to reaffirm why i have the scraps and reusables bin, why i even keep the machine out beyond mending and also why its ok if i dont touch it for four months straight.. eventually i'll get back to it with a bit of gusto. L, you crack me up. But you also teach me so much, especially how clothes SHOULD fit. In fact, I was just trying on a shirt yesterday. Was so cute. Past self would have bought it without much thought. But after all I've read and seen about armscyes and darts and such, my eye was drawn to those areas and it looked both ill-fitting and poorly sewn. So it went back to the track. That is exactly how I feel about sewing, and knitting, and cooking, and any other creative thing. It is hard work and often boring and I kind of hate it. And yet, if I don't do some making for a couple of days, I start to feel a bit twitchy. It could be anything - the other week it was sandcastles at the beach. Just like without exercise my body starts to feel a bit creaky (curse it). My machines and I have a relationship of respect forged in a battlezone. We're comrades, though, not friends. Nothing wrong with that.